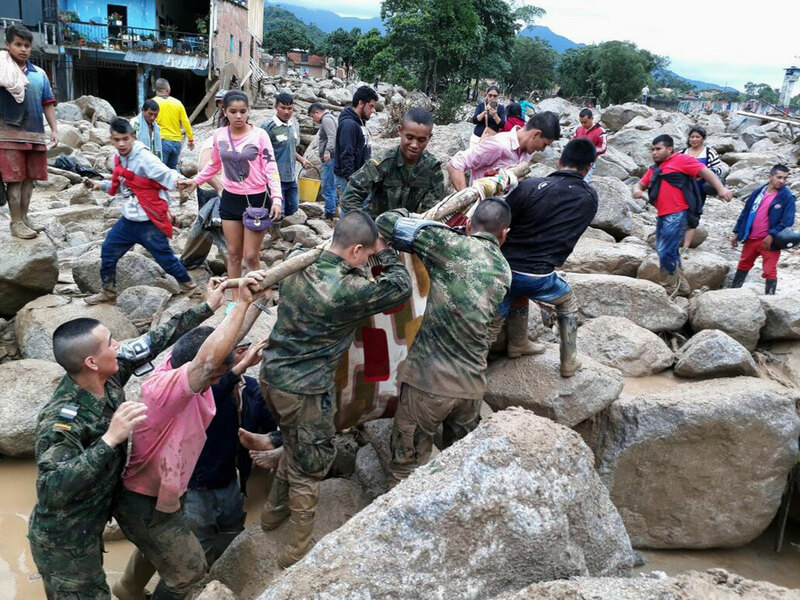 Photos show devastation caused by mudslides that toppled Mocoa, Colombia. Families and rescuers searched desperately on Sunday through mud-plastered rubble for victims of flooding and landslides in Colombia that have killed at least 210 people, injured hundreds and devastated entire neighborhoods. “We had to recover them ourselves. We think we’ll find more,” Villagarzon Mayor Jhon Ever Calderon told Reuters, adding that the town had no coffins or sanitary storage. Many families in Mocoa stayed up through the night to search in the debris, despite lack of electricity in the city. “I need to know where they are, if they are injured or where to find them,” sobbed Maria Lilia Tisoy, 37, looking for her two daughters, one pregnant, and a 4-year-old granddaughter in the rubble. The army said on Saturday that the death toll was 254, with 400 people injured, but Santos gave a lower toll, of 210 killed and 203 injured. Disaster officials said 600 people were staying in emergency housing and social services had helped 10 lost children find their parents. The disaster came amid extreme weather across the region, including deadly flooding in Peru and drought-induced forest fires in Chile. Families of the dead will receive about $6,400 in aid, Santos has said. The government will cover hospital and funeral costs. Even in a country where heavy rains, a mountainous landscape and informal construction combine to make landslides a common occurrence, the scale of the Mocoa disaster was daunting compared to recent tragedies, including a 2015 landslide that killed nearly 100 people in Antioquia. Colombia’s deadliest landslide, the 1985 Armero disaster, left more than 20,000 dead. Santos urged Colombians to brace for continued rains and take precautions against flooding.